NOTE: This is preview material and is subject to change. Information listed here is good as of 12/19/2014. The Power BI Designer is a new companion application for Power BI. It is a standalone Windows Desktop application that can be downloaded from the Power BI site. This application combines Power Query, Power Pivot Data Model and Power View into a seamless experience that will allow customers to build their Power BI elements in an offline fashion and then upload to the Power BI Service. The Add-ins for Excel 2013 and later are still available and customers can continue to use that to model their data and build reports. The Power BI Designer will be another option and allow customers with an older version of Office to be able to create reports. 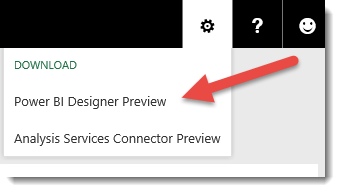 To download and install the Power BI Designer Preview, you can click on the COG icon in the title bar of Power BI Public Preview site and select the designer option. Within Excel, it could be confusing for customers on what the right approach was to get data into Excel. They could do this with the Excel Data Tab, Power Query or Power Pivot. There really wasn't a right or wrong answer. It just depended on what you wanted to do with the data. 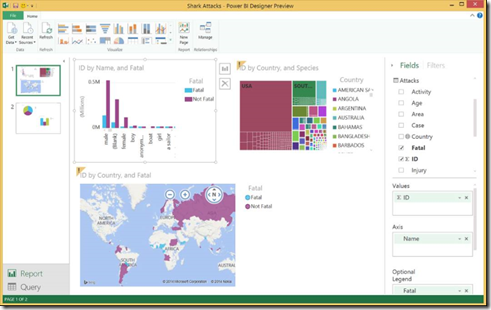 Within the Power BI Designer, there is one spot to get data from. This is from the Get Data Ribbon item. The dialogs will be familiar and look like the Power Query Add-in for Excel. The data sources will reflect the same. After shaping the query, like you can in Power Query, you can then load the data into the Data Model. Excel hosted the Vertipaq engine within the Excel Process. This wasn't necessarily a true Tabular model. Within the Power BI Designer, we host a local instance of Analysis Services in Tabular Mode as a child process to Power BI Designer. This allows for a true Tabular model. You can connect to this Analysis Services Instance using Management Studio or Profiler. You will need to discover the Port in order to connect to it. You can discover the port with tools like netstat or TCPView from SysInternals. After loading data, you will see the Report Design canvas with available fields right away. From there you can drag things onto the canvas and change the visualizations to match what you want. You can also create additional pages. This is the HTML5 Power View Experience and the Visualizations should match what is available in the Service. Realize that this is still Preview, so not all features are in place with this application yet. One thing to note is that we don't have full control over the Data Model. It does provide the ability to add relationships, but that is about it. Also, we are not able to add synonyms to assist Q&A within Power BI Designer. For Power Query, we don't have ability to Sign-In, perform an Online Search or share a query. These are only available from the Excel Add-In currently. We also cannot cross between Excel and the Power BI Designer. For example, if we have a Data Model in Excel, I can't use that and create reports within the Power BI Designer. Also, if I have a Data Model in Power BI Designer, I can’t point Excel to use that. You have to pick one or the other. More features will come as we go forward and the tool will be enhanced. We may also see the ability to design a Dashboard within the application in an offline fashion. A new file format is created for this with the PBIX extension. This is similar to an excel file in the sense that you can rename it to a ZIP file and look at the contents. It contains the Queries, Data Model and reports. After you have saved your PBIX file, you can then go to the Get Data screen within the service. 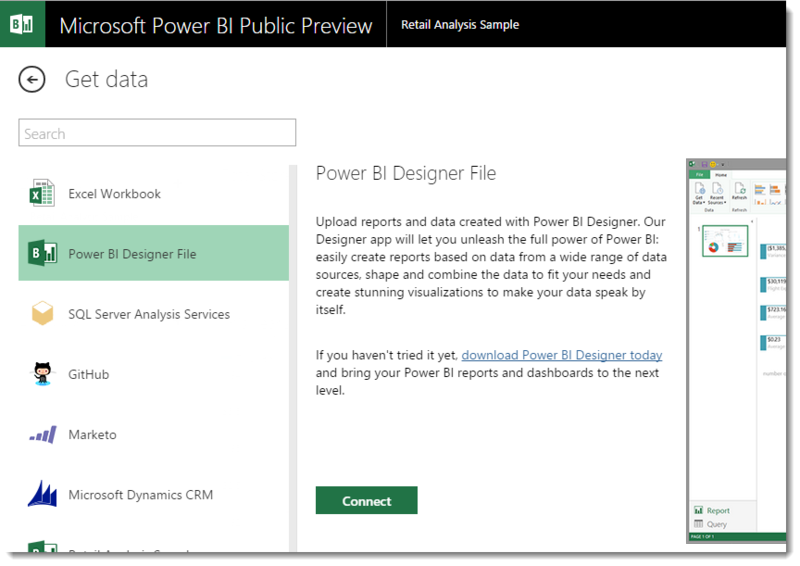 Select the Power BI Designer File and the click Connect. You can only load from your computer currently, so we can update based on a file that would be placed in OneDrive.